Currinda helps associations to manage and track their members’ professional development with CPD. This article explains the setup process for managing assessments with CPD points. Further help is available for setting up CPD points and tracking. TIP: Also, you’re always welcome to use our in-app chat button (connects to our online Help Desk) or email support@currinda.com for any questions we can answer to help you along. ‘CPD Points – Continuing Professional Development’ – CPD points are tracked within Currinda to monitor and manage member engagement with their organisation’s events and activities. ‘Event’ – Any task that an individual member can complete to earn Continuing Professional Development (CPD) points. Examples include a training course, a conference or an exam. ‘Assessment’ – Signifies completion of an Event. 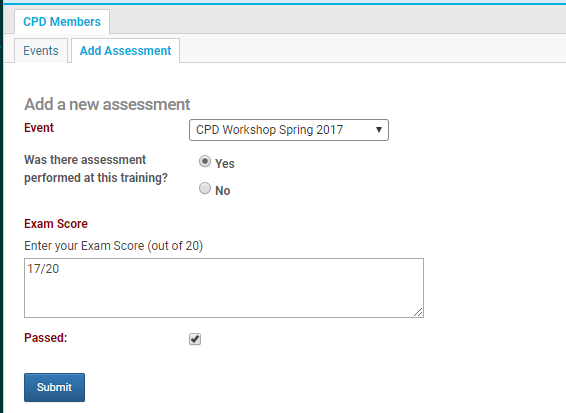 Assessments also track the sum of CPD points a member has currently earned. ‘Extra’ – A question that can be asked when a member is completing an assessment. ‘Event Type’ – A type may assigned to an Event in order to link the Event with Extras (questions) pertaining to an Assessment. Note: A member earns CPD points by completing Events. To add an Assessment for a member, you must firstly select that member from your organisation’s member list (member list via > Members tab on your LHS tabs menu). Then select the > CPD tab from your horizontal tabs menu. From this page you can view all the current assessments that this member has completed. To add another assessment for an event you must select the “Add Points” button. From the ‘Add a new assessment’ dropdown box, SELECT the applicable Event. Any associated Extras questions will be displayed (example ‘what was your Exam Score’). TIP: If the applicable Event has not already been created in Currinda, you can create it immediately by selecting the ‘Create new event’ option from the dropdown menu. As an administrator, you will be able to also set whether, or not, the member has achieved a ‘Passed’ status. Assessments that do not have a ‘Passed’ check option will not count towards a user’s total Assessment/CPD points. Upon submission of the ‘Add a new assessment‘ form, a new Assessment for that Event will be created.